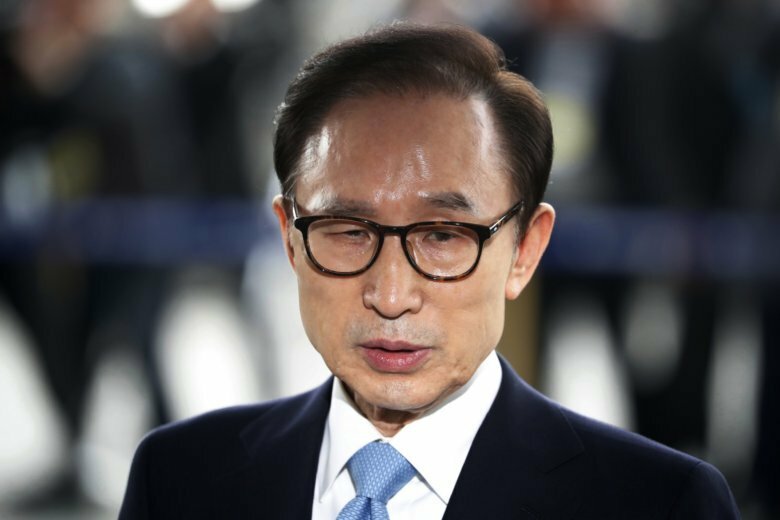 SEOUL, South Korea (AP) — Former South Korean President Lee Myung-bak was convicted and sentenced to 15 years in prison Friday in a corruption case that has badly tainted his status as the country’s first leader with a business background who once symbolized the country’s economic rise. Lee’s conviction came six months after his successor and fellow conservative Park Geun-hye was convicted in a separate corruption scandal that triggered the country’s greatest political turmoil in decades. She is serving a 33-year prison term. The back-to-back scandals severely wounded conservatives in South Korea and deepened a national divide. The court said Lee took 6.1 billion won ($5.4 million) from Samsung in bribes that were used in legal expenses for DAS. That money led to a 2009 government pardon of Samsung’s convicted chairman, Lee Kun-hee, the court verdict said. The Samsung chief had been earlier fined and sentenced to a suspended three-year prison term in connection with losses at a Samsung affiliate and tax evasion. Lee, 76, who has denied most of the allegations, didn’t attend the court session, reportedly citing his health and in protest of a court decision to allow a live broadcast. His lawyer said the broadcast would hurt South Korea’s international image and undermine national unity, according to the Yonhap news agency. He joined Hyundai Group’s construction arm in the mid-1960s and led the company’s rapid rise at a time when South Korea’s economy grew explosively from the rubble of the 1950-53 Korean War. Lee won the 2007 election by the widest margin in South Korean history at the time owing to public hope that he could revitalize the faltering economy. But his five-year term was marred by a global financial meltdown, massive street protests over the resumption of imports of U.S. beef and a rising military animosity with North Korea. Before his arrest, Lee accused the current liberal government of President Moon Jae-in of retaliating over the 2009 death of Roh, whose corruption investigation occurred when Lee was in office. Moon, who was Roh’s friend and chief of staff, responded with fury, calling his accusation a challenge to South Korea’s judiciary order. Previously, Moon called the Roh investigation politically motivated by the Lee government. Moon, who has a public approval rating of about 65 percent, faces growing conservative criticism that he’s done little to revive the economy while focusing too much on engaging with North Korea and digging out wrongdoing committed under the Lee and Park governments.